The machines in the following galleries are all drawing machines. There was one in the gift shop which you could purchase a token and a piece of paper for and then have it draw you your very own picture. I didn’t do one but we did see that machine in use while browsing in the shop. Currently the museum is also exhibiting works by the Swiss artist Eva Aeppli in one of its rooms. Aeppli was married to Tinguely from 1951 to 1961 and died on 4 May 2015. 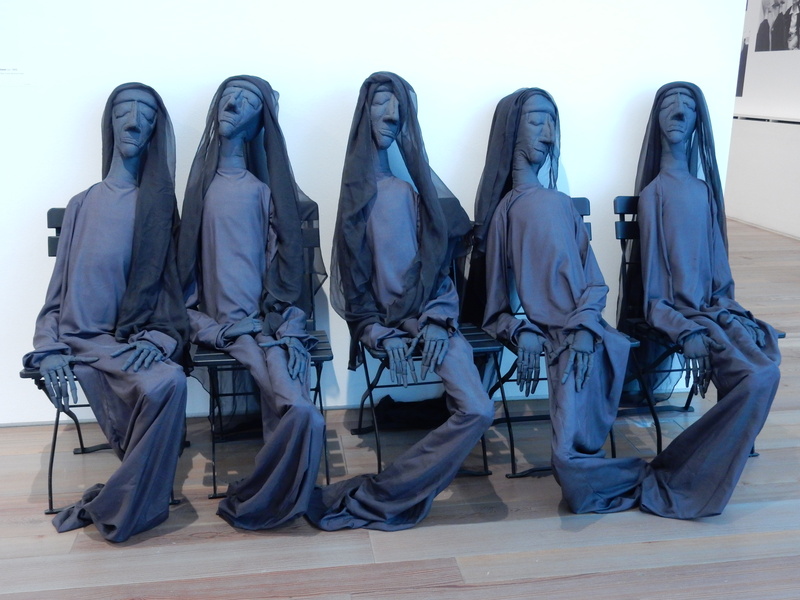 I only took a photo of one of her sculptures… how creepy is this? It’s called The Five Widows. My favourite thing in the whole museum was this sculpture that you were allowed to climb on. Parts of it also moved. I was disappointed that the spiral staircase was off-limits! Tinguely’s sculptures are not exactly what you’d call “classical” art, and neither are they particularly, pretty/decorative, but they’re definitely interesting! The museum is a great place to spend an afternoon, and I imagine children would like the moving sculptures as well (even though you’re not allowed to touch!). I really enjoyed our visit to the museum and will definitely take future visitors there. I’m linking this post up with My Travel Monkey and Packing My Suitcase for Monday Escapes. Click the button to find out more!